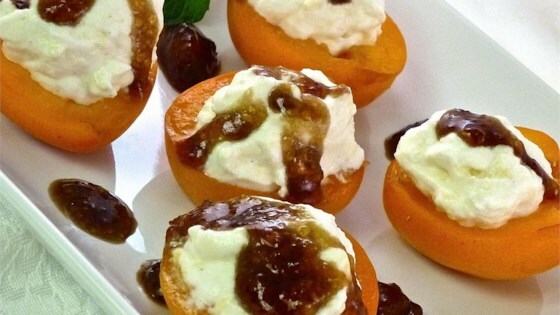 "Fresh ripe apricots stuffed with a slightly sweetened mascarpone cheese drizzled with a sweet honey balsamic sauce. You can use a piping bag for the cream to make this look extra fancy"
Beat the cream in a chilled bowl with an electric mixer until soft peaks form. Beat in the sugar and set aside. In another bowl, whip the mascarpone cheese with an electric mixer until very soft; beat in the apricot nectar, vanilla extract, and cardamom. Gently fold the mascarpone mixture into the whipped cream. Place the apricot preserves and honey into a microwave-safe bowl and heat in microwave oven until warm but not hot, about 30 seconds. Mix well and stir the balsamic vinegar into the honey mixture. Pretty darn good. I didn't have any nectar so I used a capful of brandy instead and aslo supstituted the cardamom for cinnamon. The marscapone part of the dessert was the best!